Marcos declared martial law in the form of Proclamation 1081 over the entire country on September 21, 1972, using the activity of leftist student groups and insurgent groups such as the New People’s Army (NPA), anti-Vietnam-War demonstrations and a series of bomb explosions in downtown Manila as an excuse. He dissolved Congress; suspended rights of habeas corpus, freedom of speech, press and assembly; and imprisoned the opposition Liberal Party leaders. Normally a constitutional last resort designed to protect the masses, martial law was declared by Marcos to keep himself in power and to protect his cronies. Asia’s most vibrant democracy was no more. Many people believe that Marcos ordered the planting of the bomb that gave him the excuse to declare marital law. 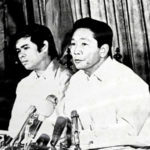 After wards he held a series of meeting and plebiscites which drew up new constitution declaring the that Marcos would remain the President and Prime Minster indefinitely, ruling over a rubber-stamp parliament. Most Filipinos–or at least those well positioned within the economic and social elites–initially supported the imposition of martial law. The rising tide of violence and lawlessness was apparent to everyone. Although still modest in comparison with the Huk insurgency of the early 1950s, the New People’s Army was expanding, and the Muslim secessionist movement continued in the south with foreign support. Well-worn themes of communist conspiracy–Marcos claimed that a network of “front organizations” was operating “among our peasants, laborers, professionals, intellectuals, students, and mass media personnel”–found a ready audience in the United States, which did not protest the demise of Philippine democracy. But as the years wore Filipinos found little if anything positive to say about martial law or Marcos. During the Marcos era, the Philippines had one of Asia’s worst human rights records. The army and police were notorious for their use of torture. Victims—which included political dissidents and suspected drug dealers— were beaten, flogged, given electric shocks. Victims. Marcos also muzzled the press, and banned strikes. Marcos claimed that demonstrations against him were staged by “subversives and people under the influence of drugs.” An estimated 50,000 people were detained for alleged political crimes under Marcos in the first five years after martial law was declared. Martial Law a Lost Opportunity to Improve the Philippine Economy?